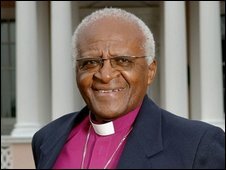 Archbishop Desmond Tutu has accused South Africa of losing the moral high ground by failing to stand up to Zimbabwe's president Robert Mugabe. The Nobel Peace Prize winner told the BBC that using force should be an option to get rid of Mr Mugabe. South Africa's African National Congress (ANC) leader Jacob Zuma has also called for a quick end to what he describes as an "untenable' situation. And the UK foreign secretary described Mr Mugabe a "stain" on Zimbabwe. Archbishop Tutu also said he was saddened that his own country appeared not to be on the side of Zimbabweans. He said: "How much more suffering is going to make us say 'No we have given Mr Mugabe enough time?'" South Africa had a leadership role as its president chairs the Southern African Development Community, he added. But he told BBC Radio 4's Today programme that South Africa had instead betrayed its legacy by blocking firmer action from the United Nations. He added: "I want to say first of all that I have been very deeply disappointed, saddened by the position that South Africa has taken at the United Nations Security Council in being an obstacle to the Security Council dealing with that matter. "And I have to say that I am deeply, deeply distressed that we should be found not on the side of the ones who are suffering. I certainly am ashamed of what they've done in the United Nations. "For the world to say 'no, we are waiting for South Africa's membership of the Security Council to lapse and then we can take action'." The archbishop said the situation was an "awful indictment" to a country that had a "proud record of a struggle against a vicious system". He said: "We should have been the ones who for a very long time occupied the moral high ground. I'm afraid we have betrayed our legacy." Mr Miliband was responding to a Times leading article that said the Foreign Office believed it would be a mistake for Britain to get tough with Mr Mugabe. In his letter to the newspaper, the foreign secretary reaffirmed the UK's view that Mr Mugabe had to go. "Any sane person realises that Mugabe's misrule is only spurring Zimbabwe's descent into chaos," he wrote. "But your leading article channelled frustration at his continued abuse of power into an attack on the FCO [Foreign and Commonwealth Office] without logic, fact or justification." Mr Miliband added: "As long as Mugabe rules Zimbabwe he remains a stain on that country. I acknowledge that he is also a stain on the international community, which has not been able to deliver the will of the Zimbabwean people. "If attacking the FCO would help a single Zimbabwean I would understand that might be a price worth paying. But it does not." In his Christmas message, ANC leader Mr Zuma said: "The new year must bring a speedy resolution to this utterly untenable situation." The United Nations meanwhile says it might take up to six months to control Zimbabwe's cholera outbreak, which has now killed 1,174 people. Unicef spokesman Roeland Monasch said the number of cholera cases had now increased to nearly 24,000, spreading to all 10 of Zimbabwe's provinces. Mr Monasch said 5% of cases were proving fatal, a very high rate compared with other cholera outbreaks.